For some reason, this December seems to be one dedicated to cancer more than in the past. That could be from more personal awareness on my part or a true renewed towards cancer awareness. The V Foundation (for Jimmy Valvano) is making huge awareness pushes right now. St. Jude always makes it big push in December. 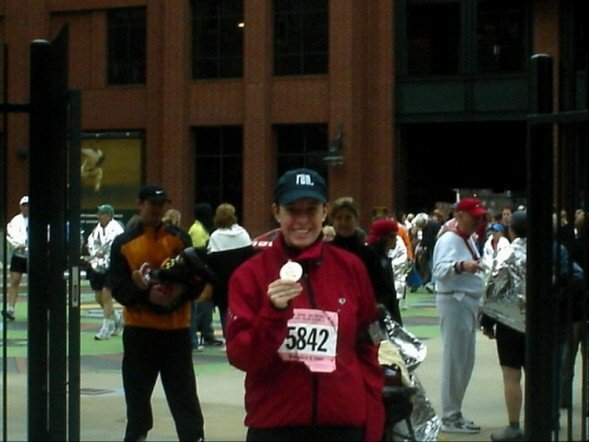 In fact, my first half marathon was the St. Jude Half Marathon in Memphis, TN in December 2005. Getting there is a story in itself. But first…a picture from the end of the race. May of 2005 was a good month. I graduated from the University of Arkansas, started my first real job out of college and had my first paid holiday (ha!). Things were going well! I was making friends in Little Rock, AR and finding new hobbies. I did not know I could love rock climbing so much! I was at my boyfriend’s parent’s house at the end of July for dinner and felt a pronounced lump on my neck. I asked his mom if she saw anything and she just gasped. I knew it couldn’t be good. The next morning I went to the ER to have it checked out and was immediately referred to a specialist the next day (Monday). The doctor was unsure of what it was so he ordered an MRI for the following week. 2 days after the MRI I was called from the doctor’s office saying that I was being referred to a cancer specialist – not only did I have a suspicious lump in lymph node but I also had a pretty well defined tumor in my lung. I got this call at work right before a team lunch. Needless to say I was thrown for a huge loop. I immediately told my boss and she was awesome knowing that I would have to be social for the next 2 hours after hearing pretty devastating news. My next thought went to how to tell my family. My mom is a nurse so I figured I would call her right away to get her reaction – if okay, then I’d be good. If bad, I’m screwed. So, I called and she was obviously stunned. She didn’t say much but didn’t cry, so I was still strong. My sister did tell me later that my mom immediately called her (also a nurse) crying because it was NOT, in fact, good news. After my first meeting with the doctor, he wasn’t sure of how severe the tumors were so he scheduled a surgery for early September. It would be then that I would find out my fate. Until that date, I had a full month to come to grips with what could be awful news. I took this month to really gather my thoughts, come to grips with my life to date and RUN. While I ran, I prayed. They were hand in hand. And they still are – when I am running, I am praying. That is my time with my Maker. Going into the surgery I had great peace. What will be, will be. I am happy to report that they removed the tumor in my lymph node early enough that it did not cause any issues or turn into more cancer. The tumor in my lung was deemed to be there since birth and was not going to be removed as they would have to punture my lung to remove it. …And they said as long as I am running marathons that I had not need worry about the tumor being cancerous. From the day that I found out I had zero cancer in me (October 7th, 2005), I vowed to keep up the running. And I did – I trained for my first half marathon from that very day until I completed it in early December. Running is a gift. I refuse to let it fall away lest I be ungrateful for my life. So, you may wonder why I choose to do the extreme endurance races? Because I was given a second chance to do so. It also means that my lung tumor has not grown…and I will never let it get to the point of growing past removal time! So I will keep running – for health and to meditate. I debated even telling my story because I rarely tell it. It was a time of frustration, sadness and anxiety…at just 23 years old. What I learned at a young age was to never take a day for granted. You are not promised tomorrow so do not waste today.